On August 25, the Dominican Summer League will end its regular season. Neither Cubs team is in playoff contention. 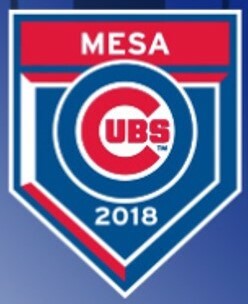 As a result, a few players could filter north in August to help either of the Cubs two teams in the Arizona Rookie League. Last year, Danis Correa (who has been injured all of 2018), Luis Hidalgo, and Emilio Ferrebus all came north in August and were part of the championship team that stormed through the Arizona League playoffs. Who could be heading north to Arizona soon? Even though there are six hitting prospects listed, three of them, at most, could end up on a roster in Mesa. Rochest Cruz – The 5’11” 150 lb. 2B/3B could bring an improving left-handed bat as his splits have improved each month. He just turned 19 and hit .349 in July. Fabian Pertuz – He might be the most likely hitter to come north. He signed with the Cubs in the summer of 2017. The 17-year-old SS looks born to hit. When he missed a few weeks with an undisclosed injury, he came back and picked up where he left off. In addition to be hit the ball for a high average, he has 3-to-2 BB to K ratio. Pedro Martinez – Well, he has a great name going for him. In addition, the 17 year old middle infielder is hitting .355 with a .418 OBP. Add in the fact that he has more walks than Ks, he’s an attractive candidate to head north. Widimer Joaquin – At 6’2” and 180 lbs., he is still growing while playing a premier power position. He is still learning to hit with that frame as he has yet to hit a HR. Still, he is going along at a .299 click. Miguel Fabrizio – A catcher who is just 17, improved his average 60 points this year and is currently hitting .299. Luis Rodriguez – Does a 0.78 ERA catch your eye? How about 45 Ks and a 0.73 WHIP? How about just 5 BBs in 46.1 IP? You get the drift for this 6’1” and 180 lb. lefty. Pitching is a key part of any championship run. He could be a key cog to that effect. Misael Garcia – At 6’2” and 190, he’s still growing and still improving as a power arm. Ben Badler of Baseball America was highly impressed by Garcia’s new size in June and improving arsenal as Garcia continues to get bigger. More than likely, Garcia will be in Mesa next spring. He’d be a longshot for this August at just 17-years-old. However, Garcia has 35 Ks in a tad over 31 innings. A benefit of these prospects heading north is they end up staying for Fall Instructs. In addition, the players usually end up in MiLB Spring Training the next year. The prospects get more of a bump in their development in Mesa the next half a year. Next ›Are There Any Cub Prospects Breaking Out in the Second Half?